It’s SolarWinds’ turn to run through the eigenmagic spreadsheets of wonder! Gross margin over 92%. That’s right. Net Income over 30% of sales revenue. 30%! It’s like SolarWinds have a money tree that fruits all the year round. But what about growth? How does an average of 30% growth in sales for 2009 to 2012 sound? That’s an average of 30% each year. And shall we combine that with an average 38% net income growth per year? Would that be nice? This is why SolarWinds has a market capitalisation (at their EOFY 2012, which is December 2012) of $3.8bn on sales of $291million, compared with, say, Commvault, who have a market cap of $3.7bn (at their EOFY 2013, which is March 2013) on sales of $496million. But market capitalisation relates to the market’s valuation on the company. Let’s look at something that tells us about how well they make money: operations. Specifically, how well do they use their assets to make stuff that people want to buy? 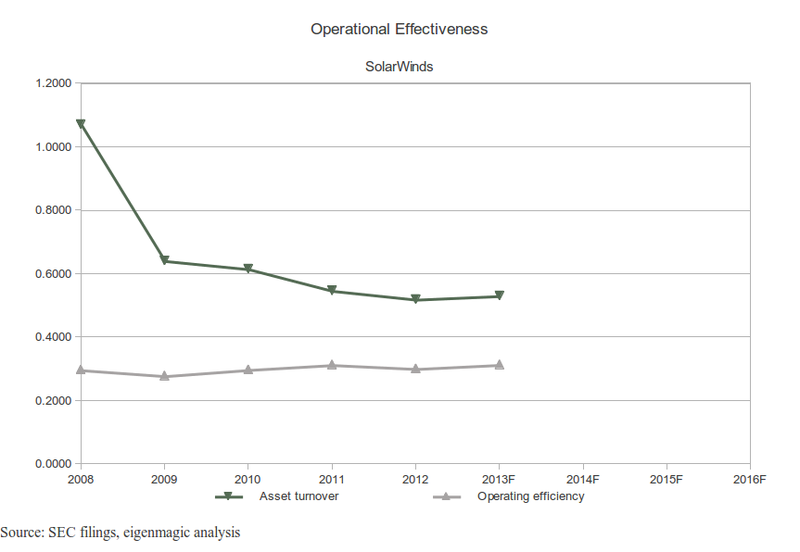 Solarwinds total assets 2012: $517.3million, generating net income of $81million. Compare to Commvault: $604.9million generating $52million. More assets, less return. That’s why I was banging on about Commvaults cash hoard and their ability to make money. They have all these assets sitting there doing nothing, while someone like SolarWinds is out there generating more income from less assets. They’re better at making money. SolarWinds sells stuff that costs them next to nothing, and they keep just about all of the cash, which they then use to buy other companies that generate some more money. Unlike other companies who are hoarding cash, SolarWinds have gone from $22m in total intangible assets in 2008 to $229million by 2012. That’s ten times more in only 4 years. As someone who loves companies that are actually run well, rather than who get lucky with the stock market, let me explain why this is so great. SolarWinds have products and services that they can charge premium prices for, and people keep on buying them. 30% yearly growth in sales, remember. But then SolarWinds have to figure out what to do with all the money. The question good management asks is: Can I use this money more productively than my shareholders can on their own? If the answer is no, then you give it back. If the answer is yes, then you keep it and increase the value of your business. And you do it at least as well as your cost of capital (I estimate SolarWinds WACC as about 8.1%) and also better than any other investment your shareholders might make with equivalent risk. And that’s exactly what SolarWinds have been doing. They’ve found other companies that match well with what they’re doing, and they buy them. Those other companies then continue to spew out cash, so SolarWinds goes and buys more. 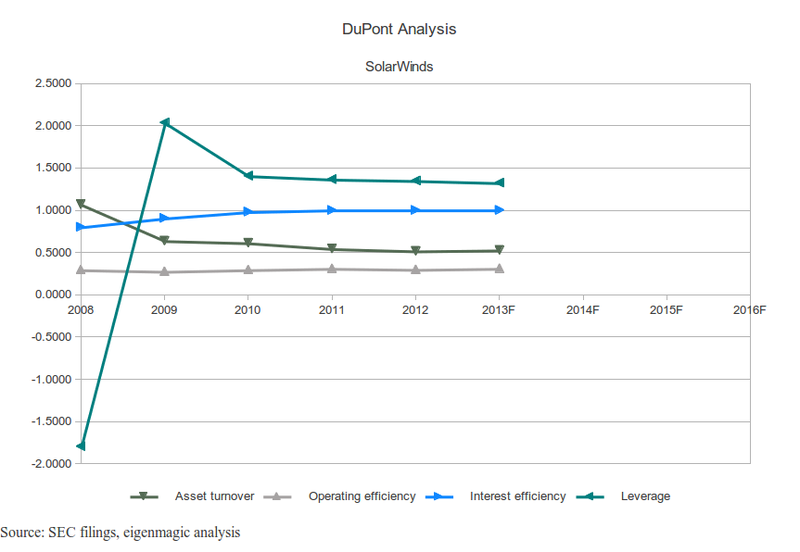 Behold the DuPont Chart, including my (very simplistic) forecast for 2013. Asset turnover isn’t that great, at only .51-ish (compared to Commvault with 0.92-ish, and Dell with 1.2 or higher), but SolarWinds is a high margin company, not a massive assets company (like Dell or a supermarket) who make smaller margins, so they have to sell a lot more stuff to make money. SolarWinds has operating efficiency of 0.30-ish, which is three times that of Commvault, and six times that of Dell. What’s remarkable is that SolarWinds has been able to keep doing this for 4 years, even while increasing their assets tenfold. That means they’re great at running their standard business, and also great at doing acquisitions. Alas, the first quarter results for this year have caused SolarWinds stock to drop a bit. I reckon that’s because of this: “Despite a good start to the first quarter, solid interest in many of our core products did not translate into the level of new license sales we anticipated and we did not deliver the level of new license sales and total revenue growth we expected for the first quarter of 2013.” as per the company’s announcement. Meh. It’s a quarterly result, and as you should know by now, I don’t care much for short term stock market quibbles. I say give them some more time to see how this year pans out. The only issue with this sort of result is that if the rest of the year is the same (and it won’t be), then they’d only grow by 8% instead of 30% which they’ve been doing for quite a while. 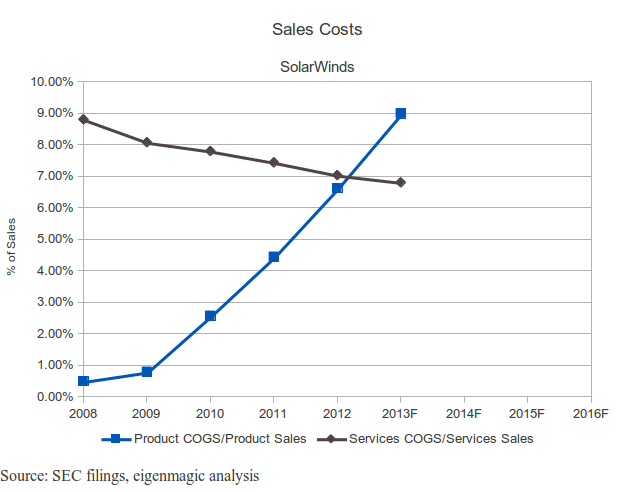 The 2013F figures are my simplistic forecast (just 4x the first quarter results) but since 2009 product (that is, licenses) COGS have increased by nearly 7 times. That’s… a lot. And what used to be much, much cheaper than services has now become about the same, or more, expensive. It’s reduced Gross Margin from about 96% to 93%, so it’s hardly the end of the world, but still, it’s something I’d want to learn more about. Digging into this stuff has really made each company more interesting. It’s going to be fascinating seeing what the tech guys talk about, and see how it relates to this stuff (if at all). The ingredients used in the mix are the freshest & no less than the best hygienic standards are maintained at all times. I think we have all said this to ourselves at one time or another.